Ohhh Lulu...: Ohh La La Pin-Up Sew Along - Planning! 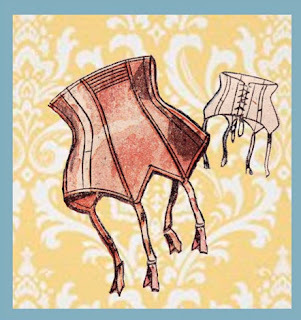 Anna wrote a great post on what you will need to prepare for the Corset Garter Belt Sew Along. If you have never sewn lingerie before - please, don't be scared! Lingerie can be made out of all sorts of fabric - from cotton to the finest silk. If you are a beginner, choose a sturdy cotton as opposed to a slippery satin. It will make your life much easier until you get your technique down pat. Before you start your muslin, decide whether you want your garter belt to lace up the back with eyelets, or close with hook & eye tape. I will be sewing a lace up corset, and Anna will be sewing one with hook & eye tape. If you choose to use eyelets and want a corset that will cinch you in, I would recommend lining or flat lining (sandwiching two pieces of fabric together, and treating them as one). I will be flat lining my corset with off white broadcloth. Adding a lining will give extra support and prevent unwanted stretching. It will also give extra support for the eyelets. I'd love to know - who plans on using eyelets and who plans on using hooks and eyes? Are you planning a bedroom look or something for every day? I am going to demonstrate how to apply contrasting bone channels. Instead of using all the same fabric, you could do the front panel, or front side panels out of a contrasting fabric. Cotton Sateen is my favourite fabric! I'm using hook and eye tape for an everyday garter belt. Mine is pink crepe back satin and I may add some lovely little embroidery or other sweet detail. Brittany, with your satin you'll definitely want to flat line it. The stitches will pull quite a bit on any satin if it's not reenforced. (learned that the hard way once)! I've got a cotton brocade that I'll probaly dye a green(it's blue).It will be for everyday under vintage reproductions and have hook and eyes. Ooh, I am intrigued. I have made doll sized corsets (laced and fully boned!) but not a people sized one. And I am always looking for a way to cinch down my post-3-babies muffin top while holding up my retro back-seam stockings. None of my current stable of shapers are cutting it. I am really impressed by this idea of yours but you should do some work for 13v0114 van heusen.